I am so excited about the following giveaway and I hope you will be also! So far, I've really enjoyed the process of making Emahry and Jonathan an I Spy Playmat, so I decided to see how easy it would be for someone else to get the fabrics they would need to make their own I Spy project. I quickly found Sew Together, a lovely shop on Etsy and asked Denai, mom of four, if she would like to donate an I Spy Kit to one of our readers. This wonderful I Spy Kit includes 100 different 3 1/2 inch squares already cut and ready for your project, so you don't have to spend a lot of money getting 100 different fabrics or put in the tedious work of cutting out 100 squares. Sew Together's I Spy Kits contain no character fabrics, but they do have safety pins, butterflies, bees, watches, footballs, ladybugs, bees, ants, and rainbows, just to name a few. If you'd like to purchase your own I Spy Kit, simply head over to Sew Together. Please, let Denai know that you heard about her shop here at A Heart for Home. 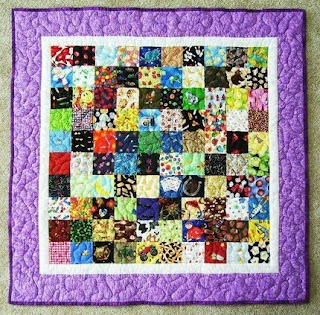 If you would love to have an I Spy Quilt for your children or grandchildren (think Christmas gifts), but don't have the time or ability to make your own, just pop on over to Denai's other Etsy shop Sew In Love where she offers custom I Spy Quilts in a variety of sizes. Be sure to contact her if you don't see exactly what you're looking for. Now for your chance to win a 100 square I Spy Kit. 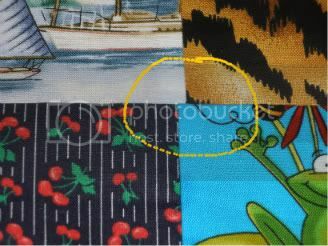 1) Head over Sew Together or Sew In Love and choose your favorite item from either shop. Then come back here and leave us a comment telling what you chose. You can gain additional entries by doing any or all of the following. ~Place our button on your blog (include a link to your blog in your comment) Simply copy the code under our button and paste it into the text box for a Html Gadget on your blog's layout. ~ Subscribe to or follow our blog (let us know if you've already subscribed or followed). ~ Post about this giveaway on your blog or tweet about it (leave us a link in your comment). This giveaway will end on Saturday, November 14th at 12 Midnight EST. We will choose a winner through random generator. Make sure you leave a way for us to contact you! Please help spread the word about Sew Together and this awesome giveaway! A mouth watering aroma filled our house this past Sunday as we arrived home from church. Soon we were seated around the table filling our mouths and bellies with this delicious chicken. Combine milk and water. Pour into a greased crockpot. Add remaining ingredients in order. Stir to combine. Cover and cook on high for 4-6 hours. When the chicken is finished, use the remaining juices to make a wonderful gravy to drizzle over the chicken and pour on top of rice or mashed potatoes. Simply place the sauce in a small pan and thicken on the stove with cornstarch or flour. Note: If you increase the chicken, simply increase the other ingredients accordingly to keep the chicken nice and moist. It's hard to believe that I've already sailed past the halfway point in this pregnancy. Our recent move and trying to get settled into our new home and routine have made the time fly by. This pregnancy, so far, has been similar to my previous two and fairly uneventful. After a couple weeks of being overly tired I could hardly tell I was pregnant. Then at 19 weeks my milk supply began to drop. At this point, Tim and I decided that Emahry was ready to give up her final nursing session. It's now been almost a month, my milk supply has returned and Emahry has only asked to nurse twice. Now at 23 weeks, I can definitely tell that I'm carrying another little blessing. The maternity clothes have been brought out and all night aerobic classes have once again begun meeting in my belly. So far all of my test results have come back good. Today we finally get to go in for my second ultrasound. Hopefully we'll be able to see all of the organs and everything will look good. 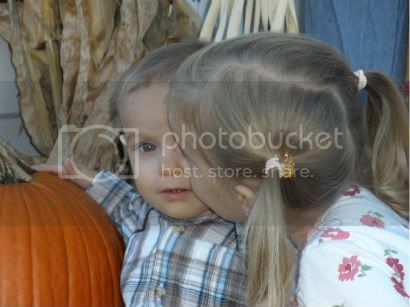 I'm also hoping we'll get confirmation of the baby's gender. Please, continue to pray that the new baby and I will remain healthy and safe during the rest of this pregnancy. At the beginning of the summer I decided I'd like to make an I Spy Play mat for the kids. 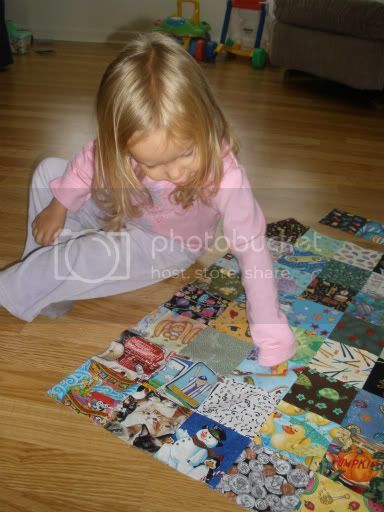 For those of you who have never heard of such a thing, an I Spy quilt or play mat is simply a large assortment of printed fabric with which children can play I Spy. For example, I spy a green lizard or I spy a striped umbrella. After a few days of planning and a lot of cutting, I started piecing together the top of the playmate. 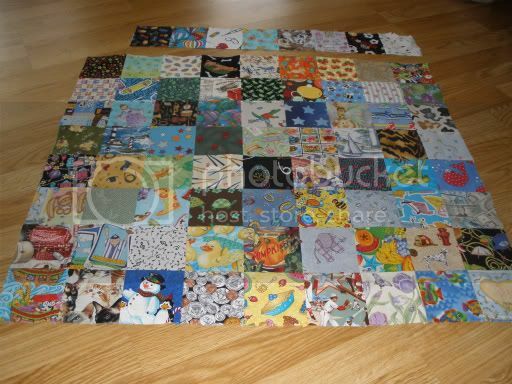 I decided to make the finished squares 3 1/2 inches and to sew them into a 9 square by 9 square play mat. This past week I sewed the majority of them together. I still have to attach the top row of squares, but I'm waiting on the top left square. I'd like to get a plain piece of fabric and embroider a magnifying glass and the words "I Spy..."
So far, I'm very happy with how this play mat is turning out, especially since this is my first time doing any type of patchwork or quilting. There are a few places where the corners of the squares don't line up exactly, but they are so few that I can very easily live with them. Emahry already likes playing with the quilt, even though it's not finished. She's pretty good at finding the things I spy, but hasn't quite grasped the concept of getting me to look for things. Here are a few links if you'd like more information or inspiration to make your own I Spy Quilt. 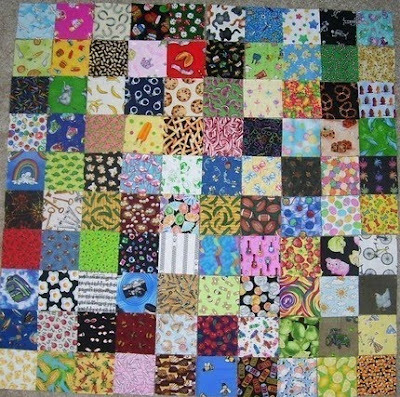 You can even buy packages of pre-cut I Spy quilt squares online at Etsy. I'd love to hear what you think about I Spy quilts. I'd also love to read about your latest crafting adventures. 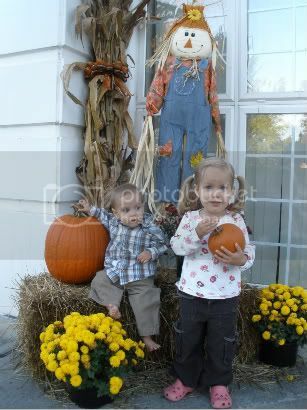 The kids and I finally found time to get outside and take some fall photos. 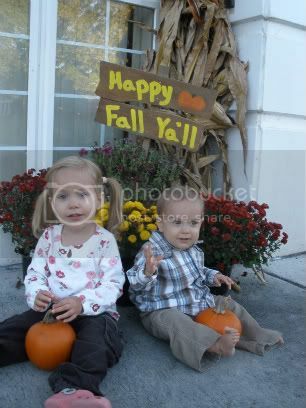 I had forgotten how difficult it is to get both little ones looking at me and smilin at the same time. We hope that each of you are enjoying this season. 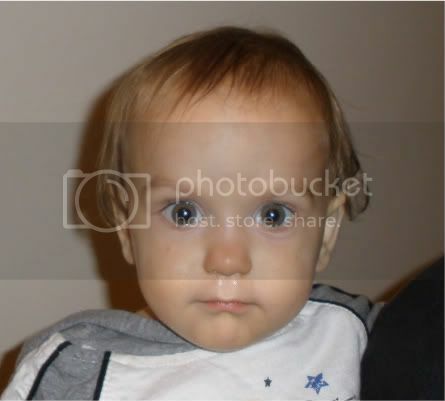 Jonathan was long overdue for his first haircut before I got up the nerve to pull out the scissors. So, we strapped him into his booster seat, loaded his tray with cereal, and went to work. 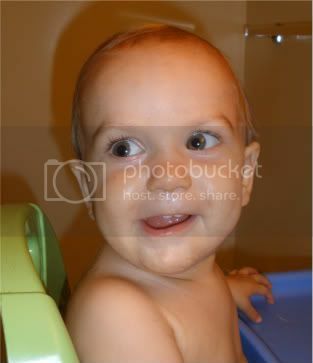 Here's what our handsome little boy looks like with his new do. ...are made for walking, running, jumping, dancing, hopping, playing -- kids. Emahry received these boots a few weeks ago from See Kai Run and she loves them. We're still waiting for the cooler months of winter, but she already wants to wear these boots. Thankfully, I couldn't be more pleased with them either. They are perfectly designed for growing feet by allowing room to move but also offering enough support. I also love the easy on, side Velcro closures. These boots are a perfect wardrobe staple since they are so versatile. I'm sure Emahry will be wearing these with jeans, skirts, and everything in between. Another added bonus is the fact that these boots are designed for girls or boys, so if Emahry doesn't completely wear them out, I'm sure they will be on Jonathan's side of the closet in a year or so. Again, we have been impressed with the quality construction of the See Kai Run shoes. Tim and I love how flexible the soles are. 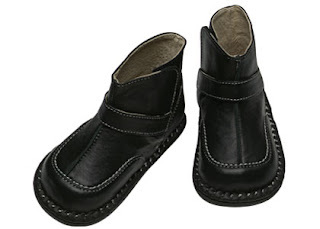 They are rubber and sturdy, but bend easily for toddler movement. The shoe itself is made of soft leather. We are really enjoying these shoes. The only negative we could find is the price. At $46 these shoes are definitely an investment, but the quality will not leave you disappointed. See Kai Run carries shoes in toddler sizes 3-9 in their See Kai Run line. They also carry shoes for babies 0-18 months old in their Smaller line and toddler size 9 to kid size 3 in their Eleven brand. Here are a couple of our favorite looks from each brand from See Kai Run's new fall/winter line. Click on the photo to get more details from the online source or visit http://www.seekairun.com/ for lots of other great options. Head on over the See Kai Run to check out more great shoes.